On one of the 'groups' we belong to someone wrote asking about PantoVison indicating they were giving some consideration to purchasing and was asking what current owners/users thought. I thought I would share my response here as well as with the group. We are all newbies at one time or another and as we progress we look back and think 'why didn't I do that sooner.' I think you'll find this about PantoVision...I have said this before...It is a computer program, being attached to an electrical, mechanical device operating through yet another version of Windows by a human...there is a learning curve and if it were easy everyone would do it. For me, if it weren't for PanotVision I would have never attempted to longarm. It only makes sense having worked with power tools all my life that you stand in front of the machine...In my opinion Pantovision brought longarming into the 21st Century, it created a more ergonomically correct posture for the user and added a much higher level of organization and provides opportunities for design that was previously limited. I just ordered Pre Design Studio III yesterday to compliment our PantoVision. It will allow us to design our own patterns and import them into Panto and at the cost of $15 per pattern will pay for itself rather quickly. I guess that's just my frugal part standing out. When the designers had to do the creation of the pattern, supply the paper, ink and machine to print that was a fair price...I just have a hard time justifying that expense to send me a file via email. We have a 22", 12' with a Standard Stitch Regulator that is complimented with PantoVision. If we could go back and do it over would we do anything differently...well it took a lot of research, going to shows, comparing machines and hours of discussions...yes it would be different...we would have gone with our gut decision and gotten Innova with PantoVision like six months sooner. I guess we all have our preferences and our experiences will, in many ways, dictate some of the paths we follow. If anyone is contemplating Innova or PantoVision don't let the negative you may hear out weigh the positive. One great machine and one really good program to compliment the machine. Can either be difficult, of course...welcome to quilting, welcome to life. Quilt till you wilt. We have exhausted the Festival, or the Festival exhausted us. Today is the last day but we will be sitting it out. I'm afraid we have given in to playing with our new toys, making a practice sandwich, trying out some new threads, playing with tension, working a little with the new cross hatch device, trying some shadowing and well just hanging out in Studio 708...not a bad Sunday...considering it is still raining and I'm not going to be able to ride. 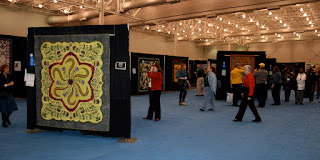 I'm sure I'm not telling anyone anything they haven't experienced at a quilt show...the artistry, creativity, craftsmanship, difficulty and patience that is displayed puts me in one of those "I'm not worthy" attitudes. But as with every show there are the Blue Ribbons, the simply amazing, NO WAY, I don't have enough time on this planet left to do that and I wouldn't think that would have worked to make a quilt...(this year the latter pertains to 'aluminum pull rings' off of beer and soda cans.) And then there is the one quilt that just rips your heart out. It doesn't have to have a description sheet, not one word has to be spoken, regardless whether it has a ribbon of any color is immaterial, it's a winner...best of show...a masterpiece...one of a kind...the reason you quilt...justifies the expense of the show, your supplies, your equipment...could break every traditional rule of quilting that exists...it may not even meet your definition of a quilt...none of that matters...to coin...a quilt is worth a thousand words...Please allow my patriotism to show through...If this doesn't just tug at your being...call for a Code Blue...your heart stopped. Have a magnificent day and quilt till you wilt. 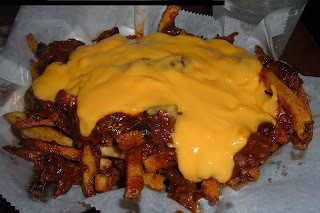 Yes today will be day three...and after two days of Chili Cheese Fries I think I'm headed for the Turkey Wrap today...what can I say...I'm a sucker for CCFries...and I have a physical next Wednesday. There goes the cholesterol...off the charts. We have determined that we have enough thread now...Superior said we could come back anytime. We are for the most part Omni users and use it both top and bottom...with good results. Having read quite a bit about Bottom Line and knowing Superior uses Bottom Line for their pre-wound bobbins we bought a couple of spools and are going to give it a try. We will use So Fine on occasion and again with good results. We also bought some King Tut...again heard a lot of good things about cotton so we'll see. According to Elaine we have saved several thousand dollars. We have left quite a few items on the floor so to speak. Would have been nice to have but not necessary...wish I would have learned that concept when I was like in my twenties...there would be a lot more money in the bank. I'm afraid I am really bad when it comes to 'must have.' There was a time when I had like five motorcycles in the garage...took some time but I learned you can only ride one at a time...I don't even want to think about how much I paid in insurance. We did run across a seam guide that has our interest, mine in particular, because it is more that just a piece of inch, inch and a half metal. It creates good long base line for me to follow. Please remember I'm used to working with a table saw that has a long fence to run my projects down. The combination of the guide and the gauge can be seen at www.sewverysmooth.com... Oh and the polish...well two of their demo machines for the "Sew Steady Tables" another product in their inventory, are Featherweights that were polished up with this stuff...looked like new. It is also used on their tables...made the acrylic slick as could be, the fabric just glided across the table. We thought about the table, just not a real necessity at this time. See; money saved. More than likely this will be my last day...if this rain gets through the area today we should see clear skies and temps in the 50's tomorrow...sounds like a good day to take the motor out for a couple of hours and blow out some of the cob webs of winter. I must admit, can't wait to get another quilt loaded, well a practice quilt anyway, to play with some threads, thread tension and my new cross hatch guide. Okay, we didn't leave everything on the floor. I don't know about you...but I hate when this happens...Tomorrow is golf day, happens in the neighborhood of 45 times a year, that's just Thursdays another 60 or so on other days...Mother Nature isn't always cooperative. But tomorrow is different...On my way to the course I will be dropping Elaine off at the Mid Atlantic Quilt Festival and then after golf I have to go to the Festival...Thursday afternoon, and Friday and Saturday...well Sunday is kind of up in the air...weather permitting there is a motor ride I may go on...Elaine says that's too bad but she would suffer and go for the final day on her own. Oh well, somebody has to do it. Let's see...going to need to stock up on threads, might have some good deals on batting, fusible interface, needles, need to find another 'original' bobbin for the Featherweight and what else can we absolutely not live without. Oh yea...Pre Design Studio III. I want to start making my own quilting patterns...It's hard to find patterns I like to quilt for the T-Shirt quilts I make for motorcyclists, carpenters, hunters, fishers, NFLers and NASCAR enthusiasts to name a few. I've seen some but I'm frugal (not the term she uses) as it has been noted by my lovely bride and having tried the program to make a couple of patterns...well $15 per pattern is a little steep in my book. It took me like 15 minutes to make the first one. I saved a $1.00 a minute...or if I made four in an hour I saved $60. Sixteen patterns pays for the program. I guess before PantoVision, and you had to use paper pantographs $15 wasn't bad, considering the cost of ink and paper. I just load it onto a USB drive and then download it to the tablet. Well got to go...laundry to do, and Elaine put another QOV on the longarm...Make it great and Quilt till you wilt. We have mentioned before the living room and dining room became Studio 708, appropriately named by a close friend who stopped by for a visit with memory of the living room and dining room. She said something like..
Well as they say, the rest is history. So here is a few views of Studio 708, today...Elaine has a tendency to move stuff around. It may look totally different tomorrow. Elaine busy working on one of her T-Shirt Summer bags, under the watchful eye and alert attack dog Nikee. What once housed the dining room furniture as intended...the Hutch even had dishes in it. Here is one of Elaine's treasures, we have a 54 Elna on it's way from Ohio. This Featherweight was found locally. It goes where Elaine goes, Bees, Project Linus or QOV events...it is proof they don't make them like they use to. It is the only thing in the house older than I am. There are times we just need to sit and talk, I see Nikee is still on duty. Here is one of the T-Shirt Summer Bags. The front and back are T's that are quilted then sewn together. Very casual and roomy. She's on a roll and has like 8-10 cut out and ready to quilt. I loaded this pattern the other day, not being too attentive, considering the program, to my knowledge does not provide a way to 'square' the pattern to the grid, and assuming that squaring was automatic. Anyway as you can tell one side is lower than the other and it remained so throughout the quilting process. The first picture is Rows 1&2 while the second is Rows 9&10. There is always some movement of the pattern to the grid because of adjustments made during the process from quilting and advancing, but for it to be 'slanting' well that was a curve ball...it translated to the quilt...fortunately able to make some adjustments when the excess was trimmed and the quilt squared. Always make them a shade larger than you want the finished product to be. Well at least we do. Quilt till you wilt. 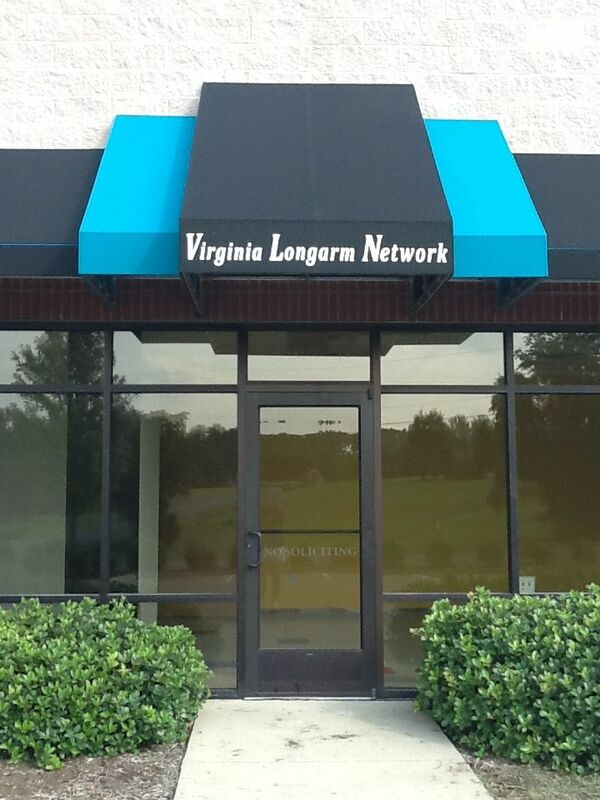 As we mentioned earlier there would be more on our distributor...Virginia Longarm and the Virginia Longarm Network in Oilville, VA. As with the Innova Longarm, based on OUR research, trials, trips to the shows, talking with others, asking around and hours and hours on the internet reading reviews and corporate propaganda, we got the cream of the crop again. Behind the machine that has taken quilting into the 21st Century through innovation, design and development they picked up an old Gammill Dealer along the way and as with ABM International the dealer realized there is room for improvement, not only in the machine but room for improvement in the way longarming can be done. The improvements in the machine were obvious the improvements in quilting would become so very quickly. For us the timing couldn't have been more spot on. It was the straw that broke the camels back, the icing on the cake the jelly for the peanut butter or the sunrise to a beautiful day. There were no local dealers for Innova and the decision maker, Elaine, although favoring Innova was ready to make a Gammill purchase because of accessible support. Almost the same day she became aware of Virginia Longarm... they switched to Innova. Being a member of a guild, all of whom own other brands than Innova, and many of them Gammills, she was being heavily influenced by Gammill owners, as she should have been, Gammill makes a fine piece of equipment and have been for sometime. And as I have said before who wants to badmouth their equipment when you've made a ten to twenty+ thousand dollar investment. But Virginia Longarm's location, switch to Innova and the personality of the people made the deal. Did I mention the people. From the owner and through the ranks there has not been one instance where we didn't feel as though we belonged and were part of the 'Network', the family of Virginia Longarm customers. The early growing pains we suffered with the software and the computer tablet would, I truly believe, have never been rectified without the assistance of Virginia Longarm. Their customer service has gone above and beyond what you would expect from a 'middle man' so to speak. They stepped up and took control of our situation and put some sweetness back into something that was starting to be very bitter. So if your looking for a longarm machine, your search brings you to the doorstep of ABM International and Innova Longarms and your looking for what we consider to be a nearly maintenance free machine, a 21st Century concept of handling quilting patterns, ergonomic consideration and adjustment capabilities that far exceed others...then if you are at all concerned with professional, courteous and reliable support from a company and all of its personnel...put Virginia Longarm on your list...at the top would be your best bet if your anywhere close...which in this case is relative...for us, close would include probably 25 states. 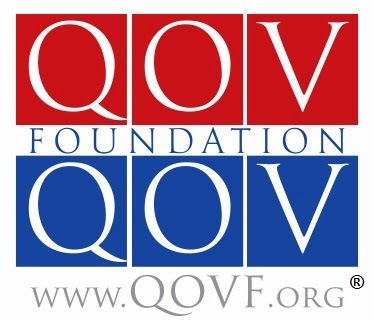 The mission of the Quilts of Valor Foundation is to cover all combat service members and veterans touched by war with comforting and healing Quilts of Valor. 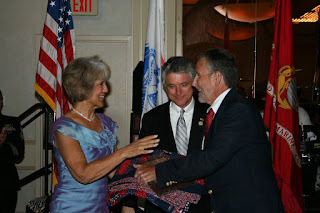 We have a special bond with this organization...we have been touched by war and its side effects. We spent more than the first year of our marriage in the Marine Corps, were married after I returned from Vietnam, are the parents of an Iraqi Freedom, third generation Marine, I am the son of a WWII Marine. We both share in the pride, honor and joy of taking a few minutes of our days giving back; even if it is just this small token. 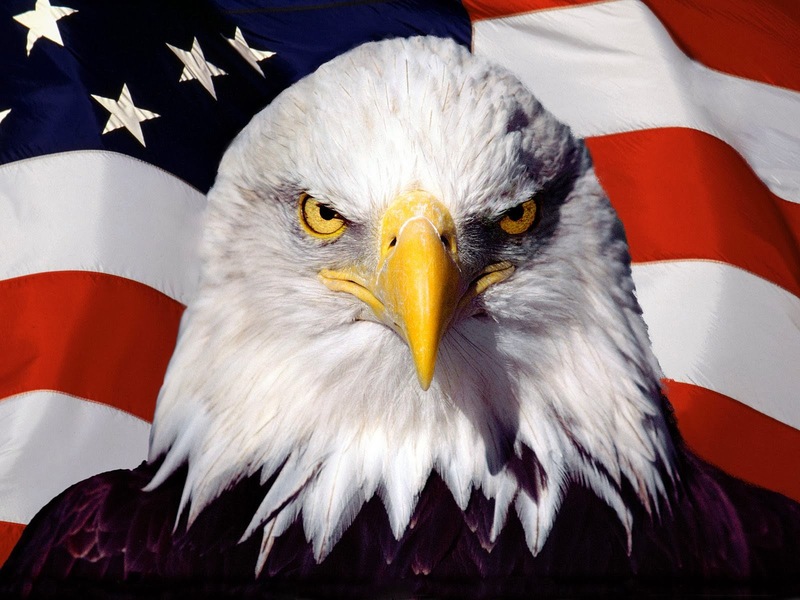 We, the quilters nationwide that participate in this program, are reminded daily the sacrifices these men and women make to maintain the freedoms so highly valued, and are committed to seeing that service is not forgotten or overlooked...a mistake that hopefully will only happen once in our history. Elaine is the local Tidewater Quilter's Guild Coordinator for QOV and I took up an interest, when as previously discussed in another post, discovered the power tool connected to the computer. So more often than not you will find a Quit of Valor close by when We Quilt. And if you see a tear followed closely behind by a smile...they are both real, regardless if it is the presenter or the recipient. And if you're anywhere close to me and I know I had a hand in making the quilt being presented...you'd better have some tissue handy...I'm going to need it. In Studio 708...a favorite place when not golfing or riding the back roads of the eastern coast. Elaine making a Quilts of Valor presentation as U.S. Representative Scott Rigell looks on. We quilt...among other things together. As a matter of fact we have no real recollection of not doing everything we've done together, since like meeting in high school in 1961. We have been very fortunate. So how in the heck did quilting get in the picture and why blog about it. The blog is a result of frustration on my part (Les). 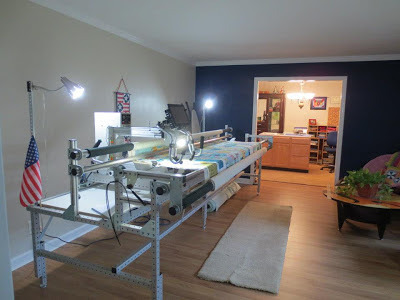 We own a longarm machine, we have had some frustrations, a learning curve, some disappointment with customer service from the manufacturer and belong to several of the yahoo groups monitored by said manufacturer, or should I say censored. They may not like what I have to say, I may not be a cheerleader for them on certain issues but I am entitled to my opinion and last time I checked maintained the freedom to express myself. With the understanding it is "their" group and I was wasting my time participating we decided on another avenue to relate our experiences, good and bad, that hopefully will help others benefit from our postings ...so here we are. The issues that created the frustrations have been resolved as the result of our distributor, who we will on occasion highly recommend if you're in the market for a 'longarm' and live in the state of Virginia, anywhere in Virginia...the drive will be well worth it. More on them later. We quilt...well sort of...It all started about a year ago at the Mid Atlantic Quilt Festival, well the day before really. 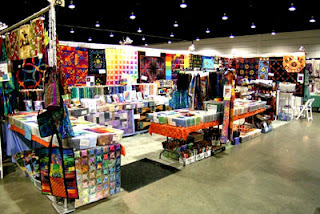 My wife ask if I wanted to go to the quilt show. Now I have gained some knowledge over the years being married to this creature of beauty. One of the things learned is, without hesitation or thought, is to respond with the correct answer...in this case if there were no need for me to go or she had no desires for me to tag along, the question would not have been ask...therefore the answer was an enthusiastic, "Yes." For reference another automatic response would be "No." To the question regarding "Does my .... in this dress?" So it is off to the quilt show. It wouldn't be long for me to realize my needed presence. If she were to decide to purchase a 'longarm machine' and any financing were required, my signature would also be. Two plus two still equals four. We didn't purchase a machine that day, or the next, but the selection process narrowed it down to two. The final decision would come some eight months later. Of the two machines, Gammill and Innova only one got my attention, the other, not in the least. But it most certainly wasn't my decision and my input was minimal and I was very selective about my chosen words so as not to tip the scales one way or another. To my delight she chose the Innova. Had she made the decision to go to the Gammill, I would have never longarmed one piece of fabric. Innova, manufactured by ABM International is in my book the cream of the crop. Please consider with very few exceptions, people will say this about their longarm machines almost religiously...who wants to admit spending ten to twenty + thousand dollars and not liking their purchase. But Innova did something the others haven't...they took the process of using 'pantographs' from the rear of the machine, got rid of all the paper patterns, put them in a software program and hooked a computer tablet to the machine and moved the task to the front. Personal opinion here...long overdue. So my first experience with Innova and PantoVision was nothing more than me standing in front of a power tool hooked up to a computer making stuff. It would have fit right into the garage between the table saw and the chop saw. It didn't though...it got the living room, and I couldn't be happier...we never went in there anyway. So beginning the day after set up..."My wife is a quilter" became "We quilt." I know she has mixed emotions about that...it's okay...like I said I've gained knowledge over the years...I know when it's time to be in the 'longarm room' or the Man Cave. Welcome to We Quilt...we hope you enjoy the journey and have the joy in sharing in our adventures in fabric...all of which I have found are not necessarily pleasant...I'm not a huge fan of a seam ripper.